Welcome to Meetings.org - the resource for information on where to find the perfect venue for your next meeting, conference, seminar or training day. From small meeting rooms hired by the hour to large auditoriums for international corporate seminars, you'll find what you need here on Meetings.org. 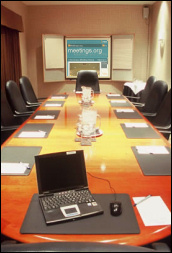 Meetings.org features articles, information and guides to hiring both meeting and office accommodation across the world. We are constantly updating the database of venues, office space providers and corporate housing specialists, as well as adding tips, checklists and guidelines on budgeting for and selecting a meeting or conference venue. If you are looking for offices to let please visit Prime Office Space for serviced offices in the UK. Meeting room facilities and both short and long term office rental information is available on Webscout, a dedicated office space service that helps companies to find serviced, managed and conventional offices across the globe. If you are planning to relocate to the United States of America, please view the commercial real estate and offices available on Offices.net.